A confluence of circumstances has kept me from posting anything since I hunkered down and cranked out my calf count summary at the end of October. I've answered approximately three million emails (give or take a handful); I've caught up on current events (given the way things are going, I kinda wish I hadn't); I've finally rid my site of hacks that were doing all sorts of funky things (in the worst possible connotation of the word funky); I've had a bunch of meetings (both physical and virtual); I've helped judge a photo contest; I've hit the gym and gotten back into decent shape; I've organised most of my trips for next year; I've read a pile of research papers about cetaceans and other marine life; I've managed to sleep at least a few hours a night; and I've even gotten some work done. Whew. And this is a link to an interview I did with Radio Australia recently about the humpback whales in Tonga. It's short, but important. 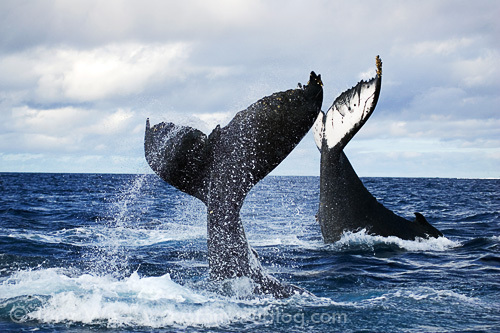 There were suggestions by another person in an earlier interview that humpback whales use their pectoral fins to stroke swimmers in the water, sometimes even lifting swimmers en masse into the air out of exuberance. Poppycock. I'm the first to admit that being in the water with humpbacks can be a magical, almost mystical, experience, but there's no good that can come of people visiting Tonga and expecting to be stroked by whales. None whatsoever. Anyway, I'm back at the helm, and I'll be posting more from now on, including information about upcoming trips. To get back into the swing of things, here is one of my favourite humpback whale fluke photos. It was a stormy day back in 2005, and it's the only time I've ever seen two adult humpbacks tandem tail-slapping. Their slaps weren't in sync, plus the seas were rocky, so it took quite a few tries to nail the right timing and composition.